My Personal Story of a Career Born in Network Wiring! 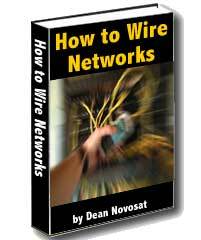 How to get started wiring your own networks. And you can learn it all in the privacy of your own home and at your own pace. And you can learn it all RIGHT NOW! My book is an Adobe PDF document that you can download right now! Complete with step-by-step instructions and loaded with full-color photos of actual work, you’ll be installing networks in record time! And you have a full 60 days to try it out. If after you’ve read it, and you find that network installation isn’t for you, return it for a full refund. This is my personal guarantee to you! But I know you will be successful. How? Because I am! I have used this knowledge to increase my net worth and have more free time! That’s right! I work less and make more money than I ever dreamed possible. And the best part is that I don’t have to answer to anyone but myself! If I want to take a vacation in the middle of the week, I can! Can you do it? Of course you can! Simply follow the simple steps outlined in my book, and you can wire networks like a professional. My book shows you how in simple step-by-step instructions. Simply click the link below to go to my order page. There, you can purchase my book for only $39.00. And remember, if you aren’t completely satisfied in the first 60 days, you can return it for a full refund. You, too, can get rave reviews for your network wiring work. Just order my book, follow the instructions, and get to work! You can order my book here for $39.00. I accept secure payment through ClickBank for all major credit cards. Now accepting payments through PayPal. Order today! You will be successful!